Momentum was very much the buzzword at Northants last season as the players propelled the club to the NatWest T20 Blast final. And ahead of the start of this season’s campaign, at Leicestershire next Friday, David Ripley’s side are desperate to get the wheels in motion. That is because Northants, like many other counties, have endured a stop-start 2016 season so far. The weather has wreaked havoc up and down the country and it was no different this week, with Ripley’s men forced to accept a draw in their County Championship Division Two game at Grace Road. That means it is now three draws and one defeat from four outings for the County so far and they are eager to kick-start their campaign in another Championship game, against Kent at the County Ground, this weekend. And that would give them the kind of shot in the arm they are looking for as they bid to get off to a winning start in the T20 competition they so enjoy. “We haven’t felt the season has got going because of the weather and inconsistency of our performances,” Ripley said. “It would be nice to get that feeling that you’re playing well, you’re dominating games and you’ve got bowlers with wickets under their belt and batsmen with runs under their belt. “That’s always helpful, no matter what format you take it into. “We haven’t quite managed that but we feel we’ve got a very fine T20 squad and almost regardless of what happens against Kent, we’re capable of coming out of the blocks with some good T20 performances. Last season, Northants lost their opening three T20 matches before that momentum and self-belief started to kick in. The Steelbacks went on to win seven of their next 10, with the team really on a roll by the time they travelled to Sussex Sharks in the quarter-final. David Willey’s heroics helped to sink the Sharks before Birmingham Bears were beaten in the semi-final at Edgbaston, where Lancashire Lighting eventually beat the Steelbacks in the showpiece. This year, there will be no Willey or Shahid Afridi, but Ripley has been able to add Sri Lankan all-rounder Seekkuge Prasanna to his squad. And the head coach said: “He’s due to arrive next Tuesday or Wednesday, in plenty of time for Friday night. “He’ll be here for the first game and we’re just organising his flights at the moment. “We’re looking forward to getting him in. “He’s got good T20 pedigree and people who can spin the ball both ways are dangerous bowlers in T20 cricket. “We see him as a wicket taker and he’s obviously got a very impressive strike rate with the bat and we know he can field. “He’s obviously a very good addition. “Yes, he hasn’t got the pedigree of a Shahid Afridi in terms of what he’s achieved in his career, but he is available for the whole summer. While Prasanna’s presence will be an undoubted boost for a small County squad, so too will the return to fitness of key men such as Olly Stone, Rob Keogh and Steven Crook. Stone took four for 56 in Leicestershire’s first innings this week, while Keogh was also in the squad and Crook is closing in on a comeback. And Ripley said: “We have got more guys coming back fit, with Olly back in the side at Leicestershire and Rob Keogh also in the squad. 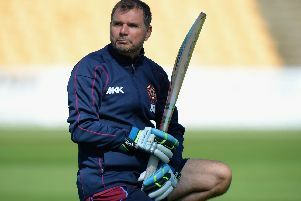 “Rob Newton has been playing in the second team and Steve Crook is back, not 100 per cent with the ball, but fit to bat and field. “We’re getting everyone back and by Sunday’s game we might have everyone available for selection even if some of them are a bit undercooked in the amount of cricket they’ve got under their belt. “We seem to be going in the right direction.